"Maybe we can all walk away amiable enemies." Thank goodness film noir will never die, but I didn't anticipate that after all these years it would go to high school. Brick is a treat for fans of the genre, a sort of unholy marriage of The Maltese Falcon and Heathers; writer/director Rian Johnson has acknowledged his debt to Dashiell Hammett, but what he's crafted here is very much his own, not just a pale regurgitation. It's a smart, slick and highly praised picture�you don't want to claim too much for it, lest you set up unrealistic expectations, but it is a rather crafty piece of work. Joseph Gordon-Levitt busts out of the sitcom career ghetto and stars as Brendan, a self-styled loner in a high school with the rigidly enforced social caste system that compares to that of ancient India. The first image of the film is a startling one: Brendan discovers a dead body, and vows to find out what has happened. (It's tough to write about this movie without spilling much of the plot, so bear with me as I try to avoid the need for spoiler alerts.) The narrative quickly jumps back a couple of days, and we follow Brendan on his journey to this awful place�the one thing Brendan loves in this world is Emily, but she's thrown him over, and Brendan is going to find out what nefarious influences have gotten to her. The film is peppered with fantastic noms de guerre like The Pin, The Brain and Tugger, and Johnson's terse dialogue brims with bristling energy while staying just this side of parody. ("The ape blows or I clam.") At times the plot can be headspinning, and you may feel as if you need a map; the same is true about a movie like The Big Sleep, though, so Johnson's picture is in good company. And the self-consciousness of the genre style meshes well with the self-dramatizing of adolescents, whose lives here are all tears and breakups and broken hearts, and the spark of new attractions, and no small amount of drugs. But Johnson isn't goofing on this here, as David Lynch might, or even the Coen brothers; and Brendan, as any worthy film noir hero does, is constantly getting the snot kicked out of him. It's almost as if his ability to take a beating and forge ahead makes him worthy of our respect, especially when we've got the creeping suspicion that this whole thing may be motivated by the paranoid, vindictive musings of a jilted boyfriend. Some of the film is graphic, but Johnson knows that suggested violence is always much more upsetting than the explicit kind, and the staccato editing gives the movie a nouvelle vague kind of flavor. The atmosphere is bleak and barren�part of this may have to do with the fact that the movie was made on a very modest budget, but there's an arresting starkness to almost all of it. It's a sharp piece of work, and brings with it the hope of more to come. Image Transfer Review: The shoestring budget shows up with the transfer, which is marred by some discoloration and scratching; you've got to admire the crew for getting the most out of their limited resources, though. Audio Transfer Review: Perhaps it's that the 5.1 track is overmixed, but some of the dialogue, which flies by in a hurry, sounds badly muffled�you may find yourself backing up a few frames, or throwing in the towel and clicking on the English subtitles. Extras Review: Johnson plays talk show host on an engaging commentary track�he makes sure that he doesn't run out of steam by constantly shuttling in new guests to sit and speak with him about the film's production, and, unlike many other commentaries, the energy on this one doesn't lag. The writer/director talks about both Hammett and Miller's Crossing as crucial influences; he and a couple of his actors discuss the audition process, and with the members of the production team, the theme is wanting simply to tell the story, and not get caught up in noir history. It's certainly worth a listen. Johnson also provides intros to a package (22m:33s) of eight deleted or extended scenes�there's a Rube Goldberg-like construction to the plot, so pulling out bits at random would have made the whole thing collapse, yet for purposes of running time and style, honing in post-production very much helped the cause. Also on the disc are audition tapes (03m:13s) for Zehetner and Noah Segan, who plays the muscle of Haas's operation. 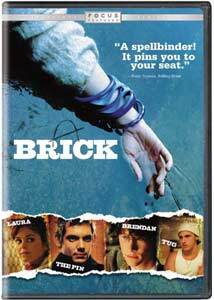 A terrific reinvigoration of a genre sometimes left for dead, Brick is a treat for film noir fans, and a great initiation for those who may be unfamiliar with the style. Sometimes you'll wish you had a scorecard to keep things straight, but the panache of the piece will pull you along.